“LEAN forward,” Juan Carlos Nunez commands me. I’m crouched on a board at San Pedro’s Wakeboard centre, hands clasped with grim determination around one end of a cable as I prepare to launch myself headlong off a pier. I had just watched in admiration as a lad of about 10 leapt onto his board like a flying fish before performing a series of dexterous maneuvers in a masterclass of this cable-propelled version of water-skiing. “Lean forward,” Juan Carlos, the manager, repeats but I’m feeling like a fish out of water. He’s suggested I start with a kneeboard rather than the upright version, a prudent decision given I have the balletic grace and poise of a newborn elephant. “Lean forward”. Easier said than done, when gripped with the overpowering fear that I may not have tied on my trunks tightly enough. Too late! The pulley whips its way towards me, the cable tenses and San Pedro prepares for the most artless demonstration in the history of wakeboarding. 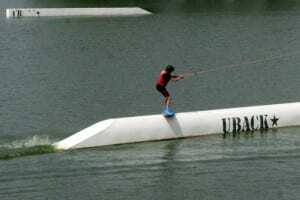 Invented almost 50 years ago, the first commercial wakeboarding cable was built in Benidorm a few years afterwards. Riders are towed around a lake by a raised pulley and cable system, which propels you through the water at breakneck speed. San Pedro’s centre is one of Europe’s best and has hosted international and national tournaments since opening in 1993. 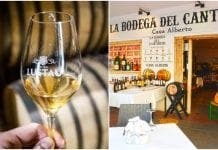 The glorious Marbella weather means the public can visit from February to December. Staff guide you through the basics. Kneeboards are available for beginners, with strap in ski-boards for the more skilled and wakeboards for experts, who perform tricks on the 2,690-foot course’s ramps. “Cable ski was invented because water skiing is more expensive,” explains Juan Carlos. “Skiing behind a boat is a good sport, I like it, but you can’t get a lot of people like here. The queue is very fast here, so you don’t have to wait too long,” he says. He’s right. Although certainly, my first foray into wakeboarding’s world couldn’t have been any less illustrious. Five seconds after being ripped from dry land, I lose grip of the cable and plunge into the drink. Clambering ashore and readying myself to go again, I assume this is going to be way beyond my meagre powers of balance. But second time around I unexpectedly manage to hold on. To my delight I’m suddenly experiencing the exhilarating rush of hurtling around the lake as the Serrania de Ronda mountains flash by. At each of the cable’s five pulleys, your body surges as it is hit by a mainline of energy and you are flung in a new direction. If you hold on, it’s a thrilling adrenaline jolt. I finish three straight laps and want to go again. Between circuits, you can recharge your batteries on a sun lounger and top up with Dutch courage at the cocktail bar. 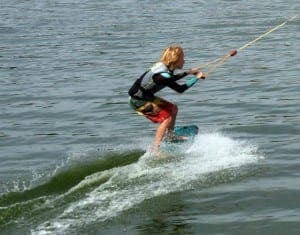 The Wakeboard centre is another great reason to visit San Pedro. And if I can do it, anyone can!